Growing up on the South Shore (area of Massachusetts south of Boston down to Cape Cod) gave my family easy access to the ocean. From an early age I spent vast amounts of my summers on the beach and in the water. I have very early fond memories of spending days on the beach with my family. My Grandmother (Father’s side) was the biggest driver for this. She grew up spending her summers in the Houghs Neck area of Quincy on the water and felt that all children should grow up near the shore. 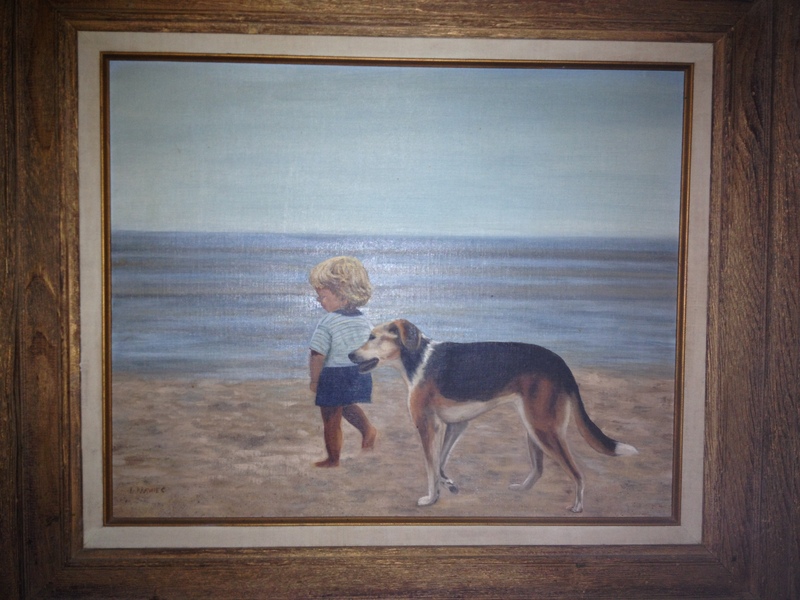 Here is a painting she did of me when I was two years old walking her dog on the beach. It currently hangs in our living room. When I was 10 my Dad won a small sailboat as a prize for meeting a sales goal at the auto dealership parts department where he worked. Yup, “Quaker State Oil” logo and all. That boat could fly for its size. Essentially it was a 12-foot surfboard with a mainsail and a jib. I could take most boats my size on the water if I kept a good coat of wax on the bottom. I would sail and explore for hours. Exploring every cove, bay and island I could find. Hiking over to stop from capsizing and getting my head in the water to cool off. And my Grandmother was content to sit on the beach until it was dark or I was done. It was a great time. Sadly, she passed in 2006. Her maiden name was Smith and her friends, including one she had for 71 of her 79 years, called her “Smitty”. When we purchased the boat it was named “Norm’s Place” after the previous owner, Norm. We knew that name wouldn’t do for us. So on April 29, 2011, the first day the boat was in the water under our ownership, we renamed the boat the Sailing Vessel Smitty. We followed the Bluewater Sailing Traditional De-Naming & Naming Ceremony. Friends, family and many bottles of wine, beer and rum joined us for the renaming. There was bell ringing, toasts to the Gods, bottles of champagne and wine (and not the cheap stuff! you don’t want to offend the Gods) were poured into the sea. We were also lucky enough to have my Grandfather with us. Which was double good luck since he was a Shellback from his days in the Navy. Gram was also an avid painter. Mostly scenes of the ocean. 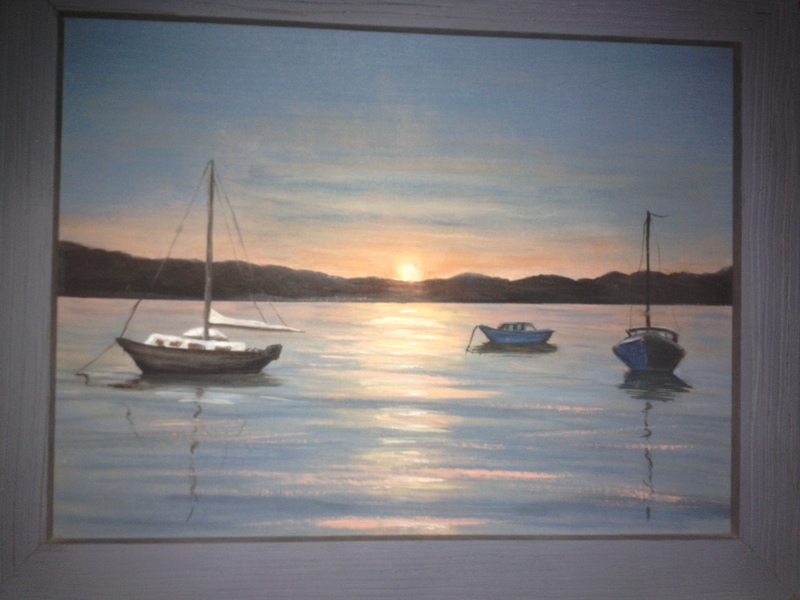 To always keep her with us, we have the painting below that she did of sailboats safely moored in a harbor hanging above the forward berth. What a neat story about your boat’s name. Your grandmother sounds like a very special lady and I’m sure she’s with you always on Smitty. We’ll be doing a renaming ceremony, too, when we get our boat. Can’t wait! Having a boat name that you connect with is great. And the renaming ceremony was a lot of fun. Do you have a name picked out yet? We’ve decided to name ours Síochána, which means “Peace” in Irish. We both have a strong Irish background / heritage, so it seems very fitting. Jesse, I really like this story behind the name of your boat. It shows that some of us have a lot of heart attached to our boats, much more than all the many who name their boat “Aqua-holic” or something of that nature. I’m inviting you to post this – and I’ll start a new category, or actually, you and I will – on my liveaboard site WeFloatThroughLife.org. I’ve already listed your blog there, so your fans can vote you up and more people can find you. Fair winds . . . Totally love this story. We did not rename our new boat, the name Summer Breeze we kind of liked. Yup, you won the boat name lottery and got a good one that came with your boat. Even if we didn’t have this plan for the name, we couldn’t have lived with “Norm’s Place”. It was good to see you guys this weekend. Thanks for reading and congrats on the boat! We had the graphic custom done by a company that does vinyl decals for work trucks in Rhode Island. So I don’t think they will be helpful to you. But you should be able to find a local company that does the same work and get them to work up a graphic for you. Thanks Jesse, and fair winds to you too! Heard you guys on the Sail Loot podcast, your mention of Annick and Giles jogged my memory (some of our best sailing friends! )…being a “Smitty” myself I took a picture of your boat in Swansboro NC when my wife and I did the ICW in 2015. Sounds like you guys have had an epic trip, I’m looking forward to checking out the blog. Fair winds! Hahaha. That’s awesome. Too bad we didn’t meet then. Where are you guys now?